Sorry for the lack of screen cap. MLB.com now allows video embedding, but it’s apparently not working here. Moving the Needle: Torii Hunter caps the late comeback with a go-ahead homer in the ninth, +.640 WPA. For the home team, the above graph ranks among the saddest. 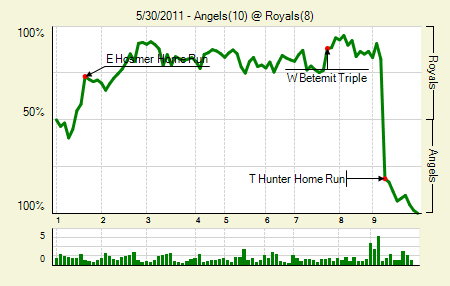 The Royals built up a 6-1 lead after two, and even after seven innings they led 8-5. A pair of solo homers in the eighth put the Angels to within one, and then Hunter’s two-run shot gave the Angels the lead. It was Hunter’s second of the game, and his fourth RBI. Joakim Soria continues to struggle. He has just six 1-2-3 innings in his 23 appearances this year. Bobby Abreu: 4 for 5, 2 2B. He drove in two and scored following both doubles. Eric Hosmer: 2 for 5, 1 2B, 1 HR. He drove in half the Royals’ runs. It appears as though selectivity is the only thing holding him back from monster numbers right now. 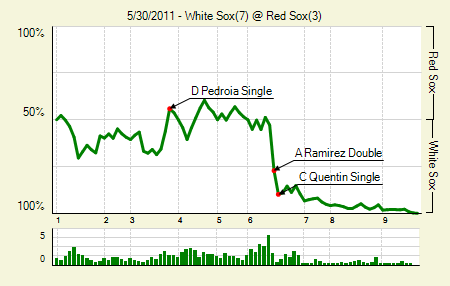 Moving the Needle: Alexei Ramirez puts the Sox up by two with a double, +.244 WPA. Through five the Sox and Sox were not only even on the scoreboard, but they had scored their three runs in identical manners: each had a two-RBI single and a solo homer. The sixth inning made all the difference. With two outs Jon Lester walked Juan Pierre to load the bases. It was Lester’s fourth walk of the day, and sixth free pass if we count the two hit batsmen. That brought up Ramirez, who hit a bloop double to right, plating a pair and setting up a runners on second and third situation for Carlos Quentin, who, facing reliever Dan Wheeler, plated another pair with a single. Adrian Gonzalez: 2 for 4, 1 HR. That’s his first homer since he hit five in four games from May 10th through May 14th. Paul Konerko: 2 for 4, 1 HR. Not only is this the same line as Gonzalez, but it’s also Konerko’s first homer since the 14th. Moving the Needle: Gaby Sanchez gets the Marlins close, but not close enough, +.167 WPA. The Marlins kept this one close through five, but the second half of the game was, as the final score suggests, quite the slaughter. 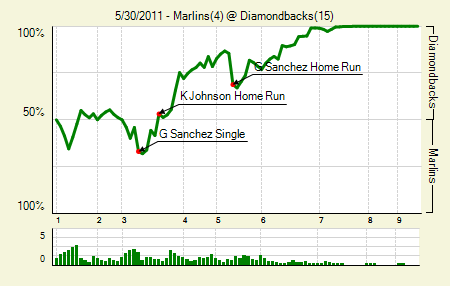 Sanchez’s two-run blast, a line shot off the back wall of the bullpen in left, put the Marlins to within one. He also had the second-highest WPA swing with an RBI single in the third. It’s surprising that none of the DBacks’ four third-inning runs made the top WPA plays. They included two home runs and two RBI singles that left men in scoring position. Kelly Johnson: 4 for 6, 1 2B, 1 3B, 2 HR. Someone’s going to hit for the cycle this year, and Johnson is just going to laugh at him. His power is starting to come around, and if he hits his ZiPS rest-of-season projections his final line should look respectable. It got pretty bad in April and early May. Justin Upton: 3 for 5, 1 2B, 1 HR. When Upton launches a homer, he intends for it not to land for a couple of months. Miguel Montero: 3 for 5, 1 HR. There is a cluster of catchers atop the WAR leaders at the position. Montero is right there with the best of ’em. Moving the Needle: Alex Avila doubles home the go-ahead run in the eighth, +.308 WPA. 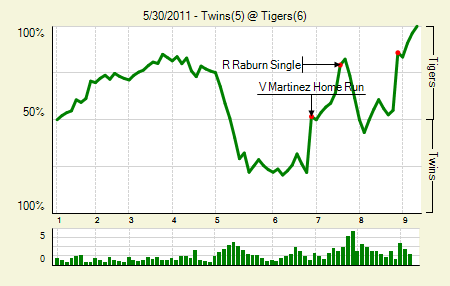 The Twins took a hold of this game in the fifth when they scored four runs to take a 5-3 lead. But the Tigers came back in the sixth to tie, and then they put together just enough to take the lead in the eighth. With a runner on first and two outs, Avila grounded one down the third base line. It veered foul once it got past the bag, and hopped up to hit a fan. Delmon Young threw his hands up to indicate as such, and the ump made the signal as well. After convening for just a second, the umps confirmed the ground rule double, but they also awarded the runner home plate on account of fan interference. On replay it looks like it just hopped up and hit a kid. It was a bad call, and it cost the Twins the game. Victor Martinez: 1 for 4, 1 HR. His two-run shot in the sixth tied the game. Jim Thome: 2 for 3, 1 2B, 1 BB. He also flied out deep to the warning track in left-center. Moving the Needle: Jorge Cantu grounds into a double play with the bases loaded in the ninth, -.350 WPA. After the Braves tied the game at two in the third, things got pretty quiet in Atlanta. From the fourth through the ninth the teams combined for eight hits and two walks. 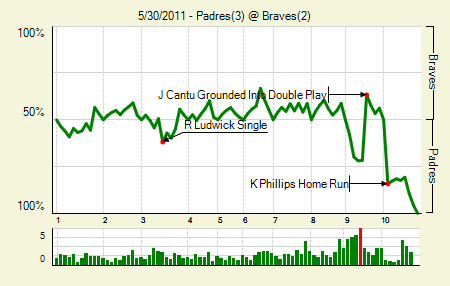 Two of those singles came in the top of the ninth, when the Padres loaded up the bases with one out for Cantu. But he hit one sharply to first, starting the 3-2-3 double play. The Padres would strike with their next batter, though, as Kyle Phillips hit his first big-league homer to give the Padres the win. Brian McCann: 3 for 5, 2 2B. He drove in both runs for the Braves. Aaron Harang: 6 IP, 6 H, 2 R, 2 BB, 5 K; 1 for 2. He scored one of the Padres’ two runs in regulation. Moving the Needle: Carlos Pena brings the lead back to Chicago with a first-inning two-run homer, +.172 WPA. The Cubs and Astros got started early yesterday, combining for five runs in the first. Pena gave the Cubs the advantage with a two-run shot that made it 3-2. 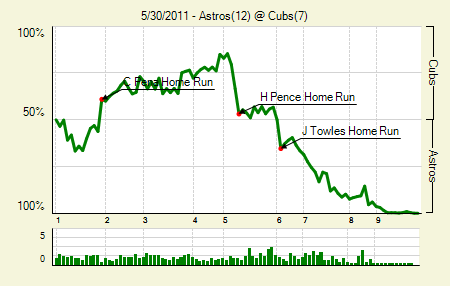 The Cubs would actually finish the fourth inning up 6-3, but a pair of homers in the fifth erased the lead completely. It was all Astros from there, as they hit four homers to punish Rodrigo Lopez and the Cubs pen. Hunter Pence: 3 for 4, 1 2B, 1 HR, 1 BB. He is on an absolute tear right now. During his current 11-game hit streak he is 20 for 46 with five doubles and two homers. Jeff Keppinger: 3 for 5, 1 2B, 1 HR. He’s had fun in his three games back from the DL, going 6 for 13 with two doubles and a homer. Moving the Needle: Mark Teixeira rips a first-inning homer, +.185 WPA. Trevor Cahill has been one of the top AL pitchers this year, but he lost it in the first inning of this game. In fact, only luck stopped the Yankees from scoring more. They started with a single, and then Curtis Granderson flied out to the warning track. Teixeira’s homer landed right above the 367 sign in right and gave the Yanks a 2-0 lead. Cahill followed that with a walk and an RBI double that could have meant future trouble if Robinson Cano hadn’t overrun the bag and got tagged out. Cahill did settle down, giving up no more runs until the seventh. Bartolo Colon: 9 IP, 4 H, 0 R, 0 BB, 6 K, 12 GB. His 2.91 xFIP is second in the American League. I honestly cannot believe I just typed that. Robinson Cano: 2 for 4, 1 2B, 1 3B. He made up for that snafu on the double by tripling later in the game. Moving the Needle: Jay Bruce’s three-run shot gives the Reds a big lead, +.146 WPA. There is a meme, beaten to death on Twitter, where someone who does something outstanding does it “like a boss.” That’s all fine and good, but Jay does it like a Bruce. His swing is just so pretty. This time beauty led to brutality, as his three-run shot put the Reds up 4-0 in the fourth, giving them enough of a cushion to stave off a Brewers rally in the fifth and hold on for the win. 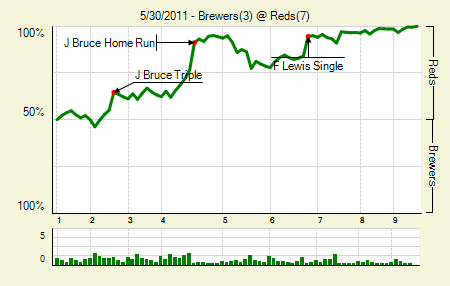 Oh, and as if the homer weren’t enough, Bruce also tripled and singled in the game. Prince Fielder: 3 for 4, 1 2B. Right now he’s settled into a spot that would fall between his 2009 and 2010 seasons. Which is to say, he’s killing it. Jonny Gomes: 1 for 3, 1 2B. He didn’t get a hit from May 18th through the 26th, but he’s come back to go 5 for 8 with two doubles in the last two games he’s played. Moving the Needle: Jack Cust triples in another run in the first, +.136 WPA. Cust gave the home run pose after crushing one into the right-center field gap in the first, but it didn’t quite clear the fence. 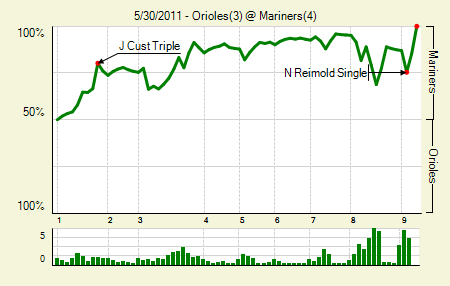 It did carom favorably, though, and neither Felix Pie nor Nick Markakis were in good position to field it- giving Cust enough time to take third, even though he didn’t appear to be busting it around first. It was his first triple since August 18, 2007, and it gave the Mariners a 2-0 lead. Doug Fister: 7.1 IP, 7 H, 3 R, 1 BB, 9 K, 1 HR. That’s his career high strikeout total. Glancing through his game logs, I didn’t see a game where he even struck out eight. Alfredo Simon: 3.2 IP, 2 H, 0 R, 1 BB, 4 K. That’s nine strikeouts in 6.2 innings since his return on May 24th. Two of his three appearances have been for multiple innings. Moving the Needle: Andre Ethier comes through with the bases loaded single, +.126 WPA. 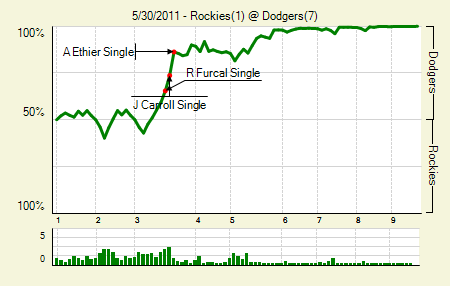 The Dodgers used the third inning as a springboard for this game, scratching across three runs. 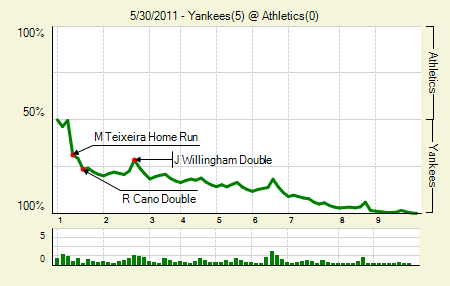 It started when the pitcher singled, and then three more singles led to the game’s first two runs. The Dodgers picked up two more, and then struck again in the fifth to ensure the victory. James Loney: 3 for 4, 1 HR. The dude gets dumped on a lot in these spaces, and for good reason. There are a few first basemen who have fewer homers than he does, but I doubt that lasts much longer. Well, except maybe Daric Barton. Chad Billingsley: 7 IP, 11 H, 1 R, 2 BB, 8 K, 1 HR. It’s amazing that he allowed 13 base runners and the only run he allowed was a solo homer. The three double plays helped. 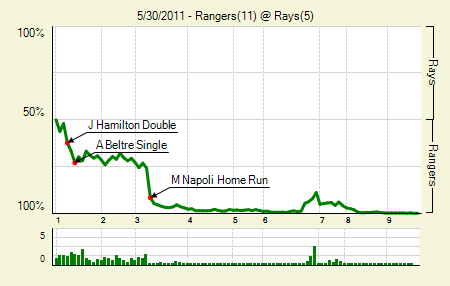 Moving the Needle: Mike Napoli’s three-run shot opens up a huge lead in the third, +.159 WPA. The Rangers opened up a 2-0 lead in the first, but they did the big damage in the third. The eruption included a pair of homers, the big one coming off the bat of Napoli, that made it 5-0. By the end of the inning it would be 7-0 Rangers. Napoli hit two homers and a double in the game, driving in five runs. Elvis Andrus: 3 for 6, 2 2B. He has 10 extra base hits in 224 PA this year, after 18 in 674 PA last year. 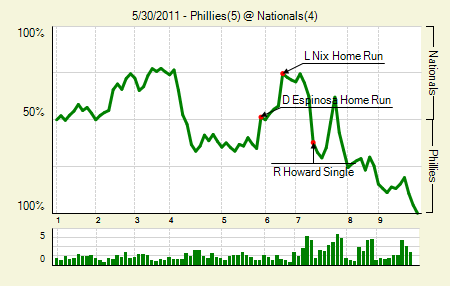 Moving the Needle: Ryan Howard ties the game in the seventh with a single, +.248 WPA. Twice the Phillies had to come back in this game, which is something you don’t often hear when Roy Halladay is on the mound. A three-run fourth turned a 2-0 Nats lead into a 3-2 Phillies one. Howard homered to start that rally. Then, in the top of the seventh, after a pair of solo homers gave the Nats the lead, Howard singled home the tying run and sent the go-ahead run to third with just one out. A sac fly scored him, and the Phillies pitching took it from there. Danny Espinosa, Laynce Nix, and Mike Morse: All 1 for 4, 1 HR. They were all solo blasts, too. Raul Ibanez: 1 for 3, 1 HR, 1 BB. The walk was intentional. His sac fly put the Phillies up for good. Moving the Needle: Jayson Nix opens the scoring with a two-run homer, +.139 WPA. It was one of those lasers that we’ve seen from so many right-handed batters at Rogers Centre in the past two years. Nix just turned on a Fausto Carmona offering, and it left the park in the snap of a finger. 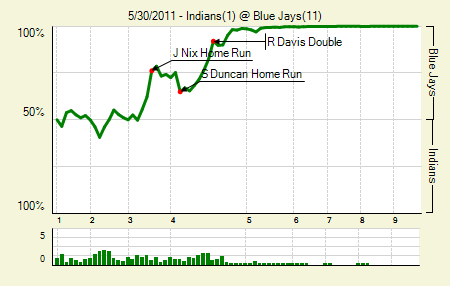 That gave the Blue Jays a base, and they built on it in the fourth when they rallied for seven runs. The saddest part is that Carmona stayed around for the entire slaughter, though the baseball gods showed some mercy on his ERA with a pair of unearned runs. Jo-Jo Reyes: 9 IP, 8 H, 1 R, 4 BB, 4 K, 1 HR. He did it! And what better way to get your first win since 2008 than with a complete game? Jose Bautista: 2 for 3, 1 2B, 1 BB. Walk and an extra base hit. Almost every damn game. Moving the Needle: Josh Thole’s double plates a pair and breaks the tie, +.202 WPA. 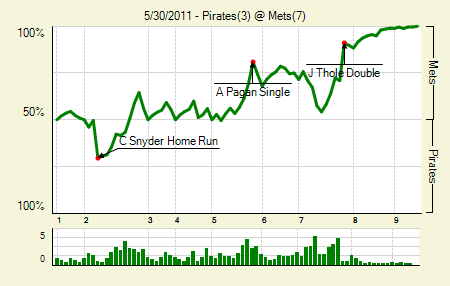 The Pirates tied the game in the top of the seventh, but the Mets had the answer in the bottom half. They put runners on first and second with none out, and then, with one out and runners on first and third, Thole doubled to the 415 sign in right-center. The hit gave Daniel Murphy enough time to score from first and give the Mets a two-run lead. They’d tack some on in the eighth, yet they still used Francisco Rodriguez to close it out. Dillon Gee: 7 IP, 5 H, 3 R, 0 BB, 8 K, 1 HR. He is one of two pitchers yesterday who set career highs in strikeouts in a game. The Mets are now 7-0 this season when he takes the mound. 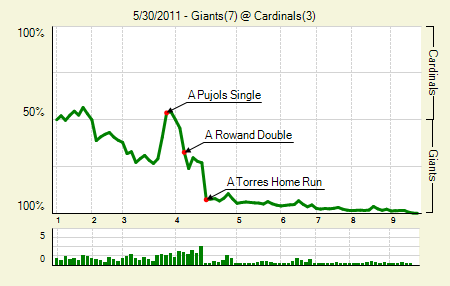 Moving the Needle: Andres Torres hits a grand slam to put the Giants up big, +.198 WPA. The Giants already had a 3-2 lead in the fourth when Torres came to the plate. He made sure that they’d be a little more comfortable. Kyle McClellan delivered him a cookie, and he sent it over the wall in right to put the Giants up 7-2. The home run would get the job done. Madison Bumgarner: 7 IP, 6 H, 2 R, 2 BB, 5 K. While this does include the two innings that he did not pitch, it’s interesting nonetheless: the first four hitters in the Cardinals’ lineup went 6 for 17 with three doubles and a homer. The rest of them went 1 for 17 with a single and three walks. We hoped you liked reading The Morning After: Game Recaps for May 30th by Joe Pawlikowski!